The geopolitical instability from South Africa may have a significant impact on the supply demand equation for Platinum Group Metals. These metals are crucial to reduce noxious emissions from vehicles as they are used in catalytic converter to lower tailpipe emissions. No suitable economic replacements for PGM’s have been found. Vehicle sales are increasing worldwide especially from emerging economies. Emission standards are being implemented in emerging economies. Demand for PGM’s is skyrocketing as we are seeing a rebound in the North American, Japanese and Chinese automobile sector. Supply is extremely tight from South Africa. Major strategic consumers could be actively searching for safe and secure supplies of platinum and palladium. Palladium is the only metal that is higher over the past year. 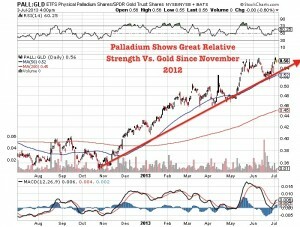 Palladium is up over 14% over the past year while platinum, copper, gold then silver are still in negative territory. 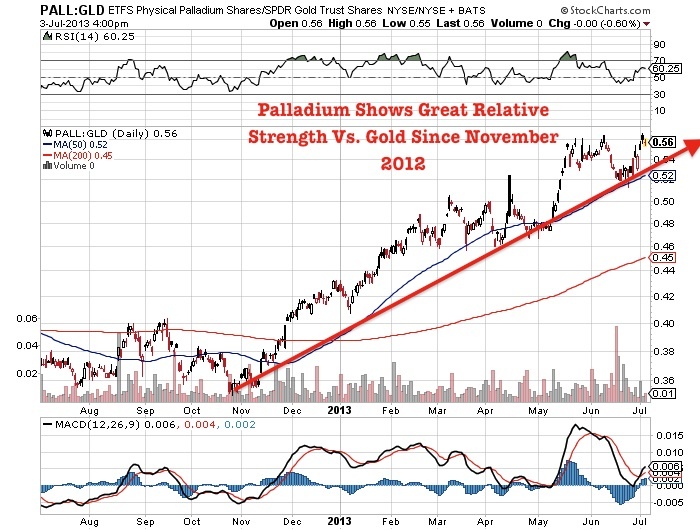 Palladium and platinum are showing great relative strength in this precious metals correction. I forecasted this since the end of October 2012. Keep a close eye on top platinum/palladium projects in North America such as Prophecy Platinum (NKL.V or PNIKF). Prophecy Platinum just completed close to a $6 million financing which shows strong support for the caliber of the companies platinum and palladium assets in the Yukon and Ontario. This is a significant accomplishment to raise these funds at a premium to the market in this difficult financing market for junior miners. This capital will help advance Prophecy's major platinum and palladium development projects in stable Canada. Investors should look for platinum and palladium projects in safe jurisdictions as the fundamentals are extremely strong with rising demand and declining supply from South Africa, which produces over three quarters of current supply. This supply demand imbalance should impact the price over the long term. This correction in the mining sector is one of the strongest declines in history and is similar to the 2001 thirty year low in the mining sector. At that time similar to now, major miners were shutting down mines and cutting back. Although it looks negative for the short term, these are the sort of moves that are characteristic of a major bottom. Mines take time to build and expand. There are major lag times that create shortfalls should prices move higher. The mothballing of projects may be setting the stage for the next major supercycle in commodities as supply is constrained. The pain that we are seeing in the sector now is setting the stage for the next boom and may be an excellent opportunity for top junior miners developing top notch assets. Although this is a painful correction, many expect this downturn to lead to higher valuations down the road and increased merger and acquisition activity. Investors should focus on high quality assets with strong management teams and shareholder support that is advancing PGM development like Prophecy Platinum. The supply of PGM's comes mostly from unstable mining jurisdictions. High quality projects in safe jurisdictions like the ones that Prophecy Platinum control could become increasingly valuable as there is a need for a safe and secure supply of these critical precious metals. Now with a cashed up treasury Prophecy Platinum can advance their high quality PGM projects and focus on building value for shareholders. 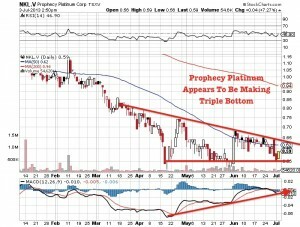 New investors can buy Prophecy Platinum at significant lows. See my recent interview with Prophecy Platinum CEO Greg Johnson as we discuss the recent financing, overall market conditions and the PGM market by clicking here... or on the video below. 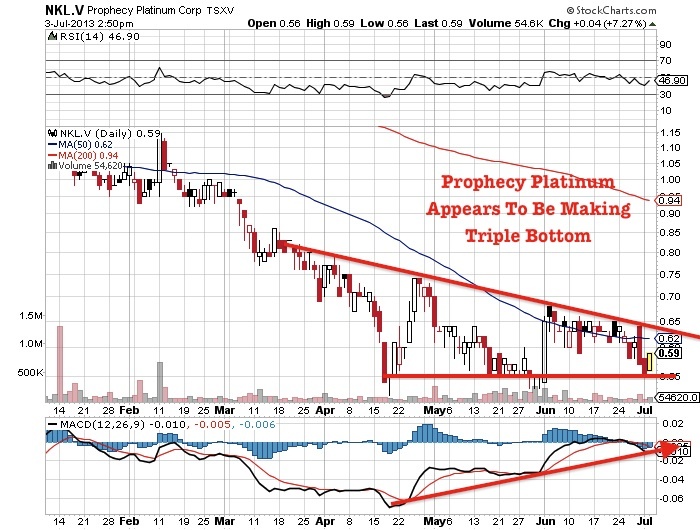 Disclosure: I own shares of Prophecy Platinum and the company is a sponsor of my website.